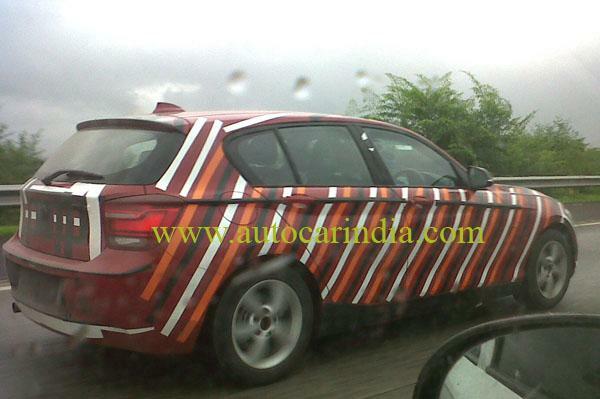 First spied images of BMW 1 series hatchback caught testing in India. BMW 1 series is first hatchback version of BMW to be sold in India. Its the most affordable BMW car at present in India. This BMW hatchback is all set to take on its rival Mercedes Benz A-class which is another luxury hatchback sold currently in Indian market. The current model which is code named F20 has been sold in international market since September 2011. BMW 1 series is 4.2 metres long which is similar to Mercedes A-class. The interior cabin is expected to be same as of its x3 and 3 series. BMW 1 series is powered with the 1.6-litre petrol and the 2.0-litre diesel engine options. However, the Indian variants might share engines with the X1 in the interest of costs. This means a 2.0-litre, 181bhp diesel and a 150bhp, 2.0-litre petrol, with the distant possibility of a hot, 168bhp, direct-injection petrol option. The BMW 1 series will be manufactured locally at its Chennai based plant. The Prices are expected to anywhere between 20-27 lakhs, this car is expected to be launched in September this year.